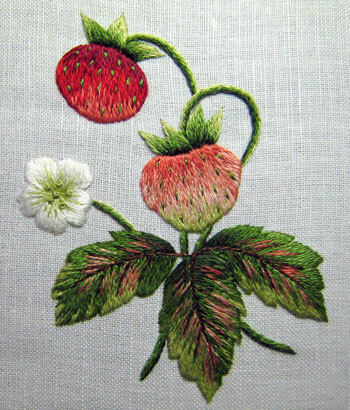 Registration is now open for Vintage Strawberries, an online embroidery class focusing on needlepainting, taught by Margaret Cobleigh here on Needle ‘n Thread. Please read on for further details about the class and information about enrolling in it. Update: the class is full. We’ll keep you posted for future classes on Needle ‘n Thread! The class will take place in a special “classroom section” on the Ask & Share forum here on Needle ‘n Thread, accessible only to participants. It is a three week class, beginning Friday, July 13, 2012. Lessons will be posted to the online classroom each Friday. The lessons will remain available for the three-week duration of the class and for several weeks after the class, so that participants can work at their own pace. Because of the online nature of the class, the primary interaction with the instructor will be via the class forum, with email support as necessary. For those unsure of how to use a forum, videos are available that will help you get acclimated to the online classroom. However, some basic computer skills are necessary. You should be comfortable using a computer and performing basic operations such as downloading and uploading files. Margaret will be available on Monday through Thursday during evening hours (US Pacific Time) to answer questions and provide support during the three week class, as well as for various times throughout the day on Friday and Saturday. Once the class begins and the participants’ needs are determined, “office hours” for immediate support on Saturdays will also be arranged. Upon the conclusion of the class, Margaret will still be available for questions for those in need, but on a reduced schedule. Enrollment is limited to a small number. Payment is made directly to Margaret through the Vintage Strawberries enrollment page. Whether you’re keen to try needlepainting for the first time or you’re a seasoned embroiderer in love with the project and looking forward to interacting with other stitchers with similar interests, this class is for you! I just signed up!!! I am so excited!! Sigh. Already full. Would love to get the kit itself, Mary. Can you ask Margaret about making that available at some time? Thanks. Well, unfortunately I guessed right. The class filled up while I’m at work! Hope you’ll run more sections of this class in the future. Of course it isn’t as if I have nothing to stitch, but I do want to learn the technique, and I love strawberries. Not surprised at all that all the class spaces filled so fast! Lucky stitchers. Any chance of a second go around? This is interesting. I bind all my inner hoops with strips of old white T shirts – the jersey doesn’t fray and stretches easily making it quick to wrap and slip stitch into position at the end. Trish de Burr recommends holding a loaded hoop over a steaming kettle (watch your fingers!) then leaving it overnight. Tried this, and it works but will still loosen later – am only using cheap hoops though. I am lucky enough to have a Millenium frame and stand (on Mary’s recommendation) but I live in UK so cheap shipping – amazing product and best thing I’ve ever treated myself to. I am sorry I missed the opportunity to sign up for this class. Is there any possibility of another class? Next Next post: I Love my Thread Cabinets!